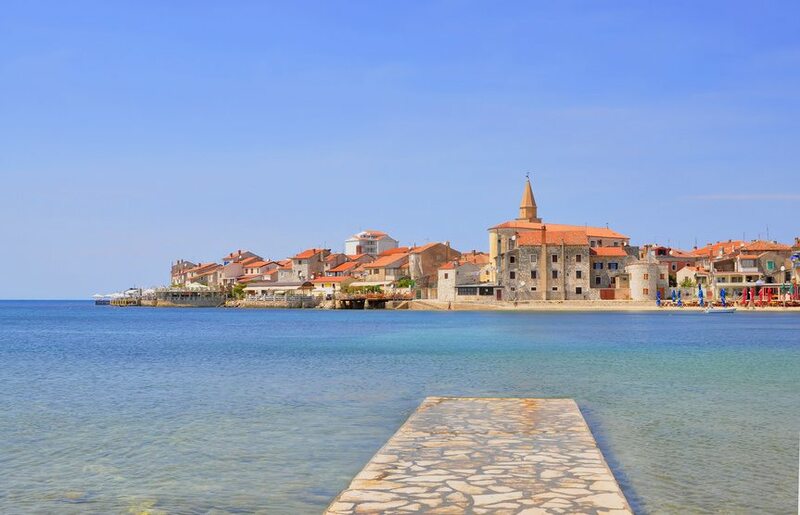 Umag and its riviera (which is about 20km long) is a very popular destination in Croatia. The old town has attractive and narrow, cobbled streets whilst its coastline is full of pretty little bays. As a holiday choice, there are some 60,000 beds in hotels and private accommodation here as well as many camping and caravan sites along the coast which are well run and highly recommended for an inexpensive holiday. Umag is also well known for its marina and the international tennis centre which hosts the Croatian Open every July. The closest airport is Pula Airport which is about about 52 miles/82km south of the town. See our Getting to Istria page for flight routes and airlines from the UK, Ireland and Europe. There is a direct shuttle bus from Pula Airport to Umag – see the timetable on the FILS website. However, another possibility – which some may find more suitable – is to fly to Trieste in Italy. In fact, Trieste is closer to Umag than Pula Airport is (it’s about 32 miles/52km away). You may even find better flight connections to Trieste as flights operate year-round, and at a better frequency in summer. Once you transfer from the airport to the main bus station, there direct buses to Umag. See our Travelling from Trieste page for details on travelling from there to Umag (and other places in Istria). Do also consider flying to Venice as another alternative. As with much of Istria, the town was inhabited by the Romans in the early centuries, and was also part of the Venetian Empire from 1248. After the fall of Venice, it came under Austrian control and was then Italian until 1943, before being given to Yugoslavia in 1953. It was part of Croatia which declared independence in 1991. Umag has a rather compact old town which is well worth a stroll through. The Church of St Mary from the 18th century is situated here. The town is home to the Sea Star Festival which takes place every May. Please see our Accommodation in Umag section. The Tourist Office in Umag is at Trgovacka 6, tel: 052 741 363, fax: 052 741 157, email: tz-grada-umaga@pu.htnet.hr. On the web, more information can be found at the Umag Tourist Office website and Istria Tourist Office website.